This is the first time that Fowler and DePaul have been named and documented as rebellion participants. Fowler’s name is extremely significant, since no other woman’s arrest has so far been documented, and numbers of witnesses attributed the intensification of the riot to the arrest and resistance of an unnamed butch woman. (Castro is named as a participant in David Carter’s Stonewall: The Riots That Sparked the Gay Revolution. Details as Reported by Complainant and/or Initiating Investigator Defendants listed below all acting in concernt [sic] did shove and kick the o fficer. 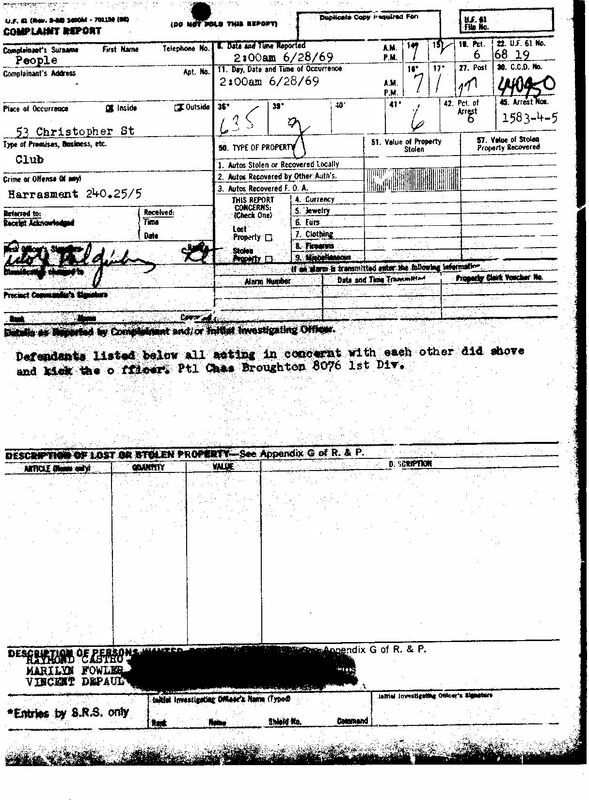 Ptl [Patrolman] Chas Broughton 8076 1st Div.